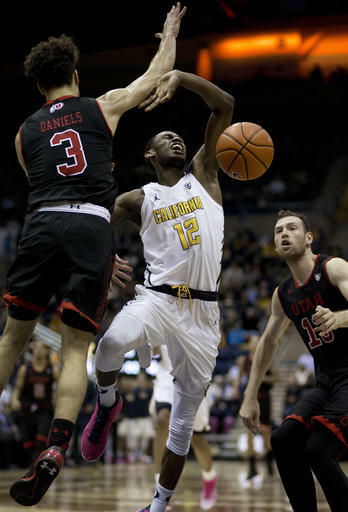 BERKELEY, Calif. (AP) – Jabari Bird scored 10 points in the second overtime including an alley-oop layup with 2.1 seconds left and California beat Utah 77-75 on Thursday night to move into a tie for for third place in the Pac-12 Conference. Bird finished with a season-high 26 points for the Bears (16-6, 7-3), who have won six of their past seven games and remain unbeaten in three overtime contests this season. Bird made two 3-pointers in overtime, but couldn’t settle the outcome until catching a pass at the rim from Charlie Moore and dropping the ball through the net. Moore had 17 points, seven assists and three steals for Cal and Ivan Rabb logged his 11th double-double of the season with 12 points and 14 rebounds. Kyle Kuzma had 23 points and 14 rebounds for his 13th double-double to lead Utah (15-7, 6-4) and Lorenzo Bonam scored 15 points, nine of them coming in the second overitme. Cal built leads of 8-0 and 12-2 as the Utes turned the ball over six times in their first nine possessions. The Bears were up 30-18 with three minutes left in the half before Utah pulled within 34-26 at halftime, despite 10 turnovers. The Utes did not take their first lead until Collette hit two free throws for a 51-50 advantage with 6:05 left in the second half. Utah: The Utes, with a chance to move into a tie for third place, dropped to a share of fifth place in the Pac-12 with USC. Cal: The Bears needed a win here with a rough final stretch of the Pac-12 schedule looming. The Bears play five of their final seven conference games on the road. Cal: The Bears complete a three-game home stand Sunday against Colorado. The Bears are 11-1 all-time against the Buffaloes in games played in Berkeley.